Trackace. The self-calibrating DIY laser wheel alignment tracking gauge. The tracking gauge designed for DIY home use. Trackace is the Worlds first laser accurate wheel alignment gauge designed for home use and storage. Poor tracking wastes fuel, causes premature tyre wear and less safe journeys. So how does the motorist avoid poor tracking. Until now its been a job for garage and tyre workshops. Book it in, travel to the garage, typically paying £25-£35 a check, plus trust their diagnosis for adjustments which is usually an extra charge. Tracking checks are not usually part of a standard service and shockingly are not part of the MOT test. Tracking gradually deteriorates as normal wear and tear takes its toll on the suspension components often noticed by wandering in the steering, especially under acceleration and unexpected under or over steer. So how often should you go to the trouble of booking into a garage for a tracking check. Most tyre manufacturers now recommend at least every six months/6000 miles, but have you ever hit a speed bump hard or parked on a kerb that was bigger than you expected, bumped the kerb or hit a pothole, these can all cause misaligned tracking at any time. With a Trackace laser wheel alignment gauge the motorist can now check their own tracking whenever they want to. Trackace uses a completely new method to commercial gauges. 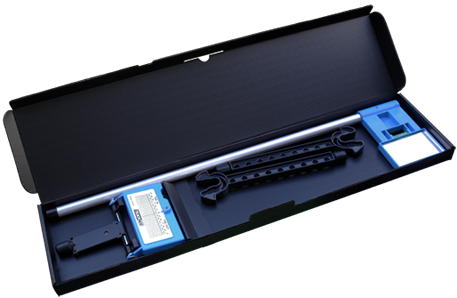 A number of patent pending features make the Trackace a low cost compact solution that uniquely calibrates automatically to each vehicle always giving accurate results straight out of the box. Almost anyone can use a Trackace laser wheel alignment gauge and then only pay for adjustments at a garage when they know for sure they are required as well as check that they have got the accurate alignment they have paid for. Saving just one wheel alignment charge and the cost of poor tracking on fuel and tyre ware, a Trackace can pay for itself on its second use, which could be in just one day for a two car household. Adjusting tracking is an easy process. Any competent DIY motorist can adjust tracking themselves at home if they have a gauge, ensuring they always reap the benefits of good alignment and save money on both checking and adjustment charges. How can such a simple checking system be more reliably accurate than commercial laser gauges. that is up to the job whilst still allowing the motorist to acquire the benefits of the solution for a cost effective price. a solution that is easily stored at home. typical facilities of the average home.